Step into the Gap – Welcome to Nicaragua! Hola! Greetings from Kate, Steph, Bernie, Chris, Tania and Vicky in Nicaragua. The first few days of this trip have been amazing and as a group we thought we would each share a part of our experience up to now. “Welcome to Nicaragua.” The sound of the flight attendant announcing, in her very American accent, our arrival brought up excitement in all of us. Tom, a friendly face and experienced aid worker from Canada, was there to meet us with another taxi driver, Jaime. On the way back to our accommodation with Jaime, we passed many low level concrete buildings with corrugated iron roofs but also on the main street every 100 metres or so these 15 metres high stunningly yellow trees absolutely covered in lightbulbs stood. Tania asked Jaime what it was and apparently they are “The Tree of Life”, the work of the first lady Rosario Murillo. It seemed so out of place. When we got back to our accommodation, we were warmly welcomed and were certainly pleased to know that there was air conditioning in each of the rooms before we got some much needed sleep after the 22 hour journey. 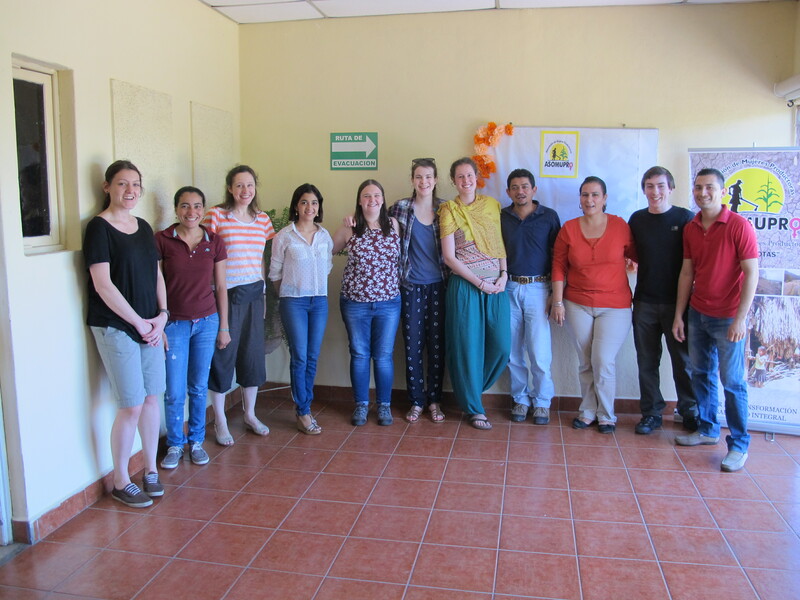 After we had arrived and spent some time resting we woke and headed out on our first day to meet the Central America CAFOD team. We were greeted at the office by the whole team who are so friendly and welcoming. 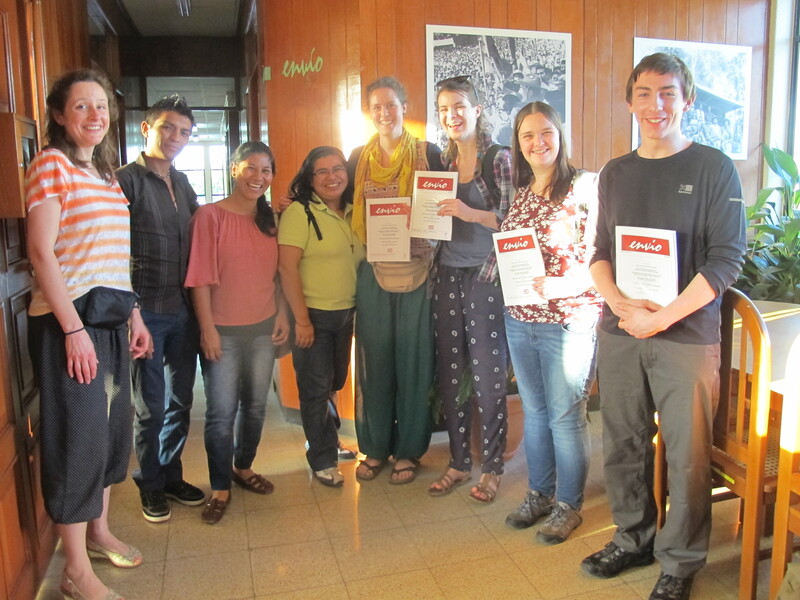 We spent time finding out more about what CAFOD’s work focuses are in Central America, in particular Nicaragua. This has given us a better understanding of the country, its history and the people. We can’t wait to spend time working alongside them and the partners they work with to really experience all that the team support partners in, whether training, networking or support. As we embarked on our second day in Managua we couldn’t wait to find out more about the partners and communities we would be visiting whilst we are here. We started our day by meeting ASOMUPRO, the association of women’s farmers. This gave us opportunities to not only learn more about ASOMUPRO but an opportunity to connect with the people who worked in there office and what they valued about the work of ASOMUPRO. This was a truly inspiring and emotional opportunity to learn. We then continued our day by meeting the John XXIII Institute to learn more about the strong friendship they have with CAFOD and the work they do out in communities. The afternoon ended with our final meeting with the Sisters of the Guardian Angel in partnership with Envio. The sisters work with young people on community leadership and empowerment. They also run a canteen which gives young children the opportunity to gather and play games. We can’t wait to meet everyone, get to know them and learn. Today is our third day and has been absolutely incredible! After a tiring few days recovering from jetlag and meeting lots of people, today was a day where we got to experience the local environment that Managua has to offer. We began by going to the top of one of the many live volcanos which Nicaragua has. This was a first for us all and had us in awe! It was out of this world to stand at the edge of the crater and see the smoke, not something I ever thought I’d be able to say. 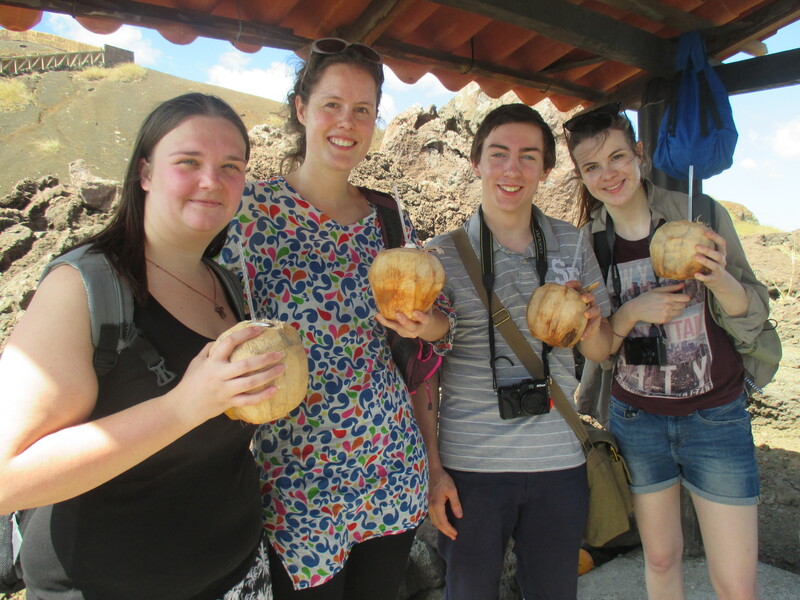 We sampled the local delicacy of coconut juice to cool us down. The afternoon was spent in paradise. We swam in a beautiful lagoon in the valley of the volcano we had just climbed. It was so refreshing after a morning of intense heat. However, what really struck me was the bumpy ride we had to get there; driving past posh luxurious hillside villas right next to whole communities living in tin roof shacks was something that hit me as quite shocking. Another thing that really struck us after yesterday, was the importance of looking after our world. We are all very fortunate to live in a place where climate change is not such a massive issue as it is in Nicaragua. The beautiful greenery and landscapes are breathtaking as we saw from the top of the volcano. 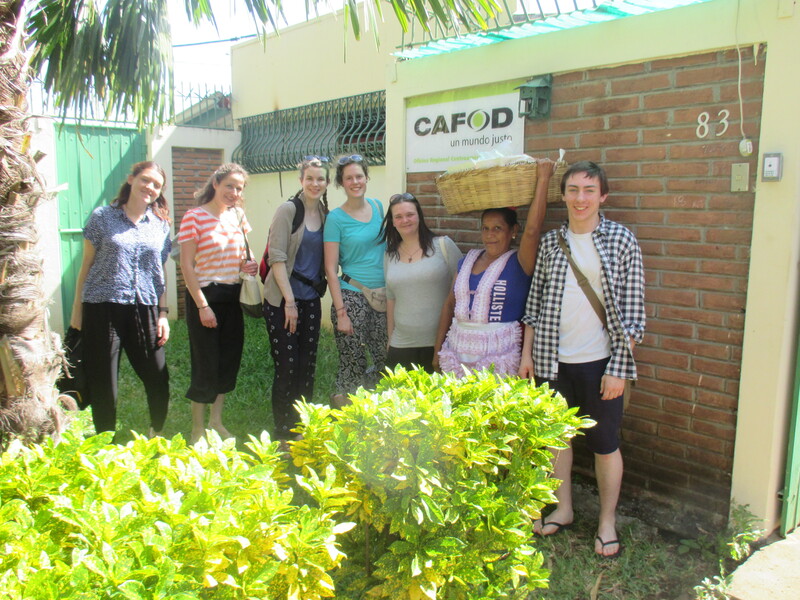 However we have also heard about how El Nino (a weather system) has affected the country, especially the harvests and CAFOD partners have been working very hard to help people become more resilient and adapt to the changing climates. We will be learning more about this issue over the next few weeks. These past few days have been truly awe inspiring, and have got the team extremely excited for the next coming weeks ahead. As of next week, we will be venturing out of Managua and going into rural Nicaragua to meet CAFOD partners to truly immerse ourselves into the communities and everyday life of those around us. Some exciting things that are planned ahead for us over the next coming weeks is beekeeping, as well as learning about the importance of empowerment of women here in Nicaragua, we also have the opportunity to visit social housing projects as well as assisting the Sisters of the Guardian Angels. Great to follow your journey in Nicaragua. Looks like you are having a great time. So pleased it is going so well. Reblogged this on Cafod Shrewsbury Blog. Tremendous to read about your first few days Stephanie et al. The photos are great. We can feel the heat on this icy blast of a day. Brian the bee man will be interested in that project. Wonderful to hear your news, you paint a great picture. Keep the photos and stories coming! Fantastic to see that you arrived safely!! Loving the pictures! Looking forward to following your adventure from windy, rainy Blackpool!! Hope your not missing me too much in the office. Its 35 degrees here. I have so much to share already with you guys I will be blogging again soon. Great to hear from you guys and delighted you are enjoying your visit. What a start, guys! Keep us posted. Please send us more on the impacts of climate change if you can. Hi Bernie, lovely to hear from you. We hope you are getting used to all the heat and having a great time! From 4L. Hiya SJV, hope your all well. I have so many stories to share already. Bubbles is well an was a bee keeper for the day. Were having lots of fun and making lots of friends. Reblogged this on CAFOD Westminster's Blog. Reblogged this on CAFOD Lancaster's Blog. Previous Previous post: Step into the Gap – first blog from Zimbabwe!